does the money thing matter? The Dutch trailrunning portal that posted my 2014 Mustang Trail Race reflection, just posted a piece that made me aware of Asics outrun the sun project: two teams racing the UTMB route (9500m +D) relay-fashion trying to beat the sunlight on the longest day (15hrs 41 min). The most interesting aspect of the post was the discussion it triggered about the marketing campaign background of this project. I’ve shared my thoughts regarding money and trailrunning in an earlier post, and my opinions haven’t changed. Why moan about the inevitable? And why moan as long as your personal options to avoid whatever negatives you perceive are not taken away? So why another post? Because we’re suckers for money’s strategies. And ‘we’ means that I include myself. I’m actually myself’s best example. These strategies do not have inevitable outcomes but to escape, to not buy into the myths, takes conscious effort. Money’s messages stick (those packaging them are experts at that), if you like it or not, and it requires mental work to become aware of them. If you’ve thought about the messages (and in the process use your gut to assess your position, by all means; you do anyway, so it’s easy advice), and like the message, want to follow-up on the message? Fine with me. But don’t go for it gut first and no checks, it’s money talking, and money ultimately doesn’t care about you, whatever message it conveys, it is self-interested seduction, not reality, it’s out there to sell you stuff that you do not need. If you still want it, who am I to nag, I fall for crap I don’t need all the time, but give yourself at least a fighting chance to resist. You probably won’t, because if our species distinguishes itself by anything (ok, there’s more, but this is not the place…) it is stories-to-self (and anyone else who might object) rationalizing our gut’s choice. And our gut is a smart but unfortunately also predictable creature, that likes praise, bling-bling, fat, sugar, and other mind-body candies, and is thus easily swayed by the tricksters hired by money to sell its stuff. And it’s also not about companies in general exploiting our weaknesses, that’s a given. Anything new, non-commercial, that hits a nerve with sufficient numbers, will be targeted by those who are in the business of turning people into consumers. The strategies used change over time. but the tendencies they engage are not of their making. We’ve been bling-bling lovers from the beginning. And we might not be able to detach – enlightenment may be as unachievable a goal as running a 6:30 100k (i.e. only for rare outliers of our species; and think about the new age industry catering to those dreams) – or not willing (we’re actors and the world is our stage, what else is there but to play your heart out?) – that all doesn’t mean we are puppets. Brands over the years have differed, but they all end up like this, and worse, before they are ditched. But by way of bling-bling it doesn’t matter: works as well as wearing the latest, hippest, etc. for attracting positive (be as doubtful as you may, I kid you not) running community attention. 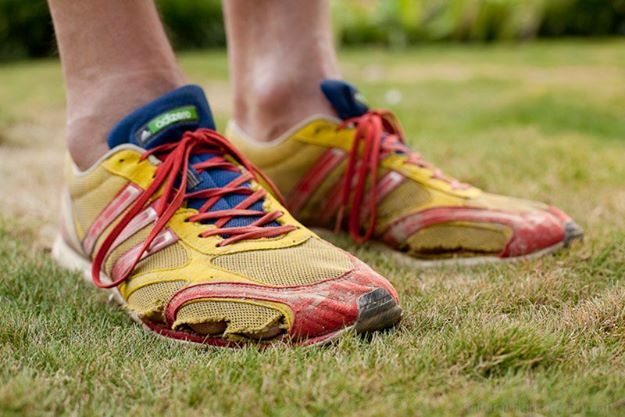 Indeed, were I one of those outliers, and compete with those 20 others world-wide, I might go for the custom-made, terrain-and-weather-specific-soled pair of beauties, that the runners in the above videos run in. But I am not, unfortunately. So what I do is go for a bling-bling strategy that doesn’t cost me much, makes me feel good, and makes for a good story. As I don’t want to leave the spin doctors without any criticism, let me ask why near all professional brand promo trailrunning videos somewhere have runners driving a car to some trail head. And, on top of that, the choice of car seems limited to two basic categories: the hippy kinda vintage minivan, or the comfortable well-paid professional kinda new model. I think I get the generic branding message, but how does it square with the back-to-nature spin that is often the main hook of the video? Get your actors onto bloody bicycles! Now, for a finishing touch, enjoy the take of George Carlin on advertising, and much else, because really, this is not about bad corporates, it’s about the ways of the world in general and us being suckers in particular. This entry was posted in (trail) running, psychology and tagged advertising, asics, branding, commercialization, consumers, George Carlin, Kendra Eash, salomon, self-referencing. Bookmark the permalink.